"Lovely Moments Marred by Political Correctness"
Disney’s new BEAUTY AND THE BEAST is an updated live action version of the 1991 animated classic about a strong-willed young woman in 18th Century France who takes her father’s place at an enchanted castle ruled by a selfish prince who’s been transformed into a beast by an enchantress whom the prince refused shelter from a storm. Though the interaction between the CGI effects and actors doesn’t always work, this BEAUTY AND THE BEAST has most of the charms and positive messages of the 1991 movie, but they are marred by some annoying, gratuitous politically correct references. “Beauty and the Beast” is one of those fairy tales that contains a profound, eternal, even overtly Christian message about the human condition. According to scholars, the story is 4,000 years old, but its modern version comes from a female French writer’s version published in 1740 and abridged and re-worked in the 100 years thereafter. In the most popular modern versions, the story is a metaphorical fairy tale about the archetypal heterosexual relationship between men and women in God’s Creation. As such, it reflects the Christian, biblical ideal of marriage where the love between a man and a woman transforms sinful hearts, especially the “beastly” nature of the male descendants of Adam, the first man. Like its 1991 animated Disney version, the new live action BEAUTY AND THE BEAST retains this wonderful theme as it recounts the story from the 1991 movie, which is about a strong-willed young woman in 18th Century France who takes her father’s place at an enchanted castle ruled by a selfish prince who’s been transformed into a beast by an enchantress whom the prince refused shelter from a storm. Though the CGI special effects aren’t as captivating as the 1991 movie’s animation, BEAUTY AND THE BEAST manages to hit many of the same emotional highs, diminished by a politically correct gender bending subplot between the villain and his effeminate sidekick, including a cross-dressing joke. Though brief, the subplot is so in-your-face and political that it detracts from the main fantasy. It also doesn’t fit in with the fairy tale’s strong heterosexual, moral and even biblical perspective. In fact, the sidekick’s homosexual attraction toward his friend, the villain, seems based on lust rather than love, but the love that develops between Beauty and the Beast is a sacrificial, pure love. The new BEAUTY AND THE BEAST opens with a narrated prologue about the selfish prince. During a storm, the prince denies shelter to an old woman who offers him a beautiful rose in return. So, the woman curses the prince and his servants, transforming him into a beast with horns, changing his servants into talking pieces of furniture and hiding the knowledge, memory and physical whereabouts of his castle from the local villagers. Cut to several years later in the village. Belle, a young woman, complains about the provincial nature of her village. Meanwhile, the villagers complain about Belle’s focus on books and learning. A young conceited soldier named Gaston, however, decides he’s going to make Belle his wife, but Gaston’s bumbling male companion, Le Fou, pines for the handsome Gaston. Belle keeps turning Gaston down, but Gaston figures she’s just playing hard to get. After all, what woman wouldn’t want to fall into the arms of a man like him? One day, Belle’s father, Maurice, rides to a fair to sell some of the magnificent music boxes he has built. Belle asks her father to come back with a rose for her. In the dark forest, he and his horse encounter a vicious pack of wolves. However, they find shelter at the Beast’s castle, where inside a feast awaits Maurice. Maurice becomes scared by the talking objects in the castle and decides to leave abruptly. On the way out, he spies a lovely rose bush and decides to cut a white rose for Belle. The Beast suddenly appears and imprisons Maurice for stealing the rose. Maurice’s horse, Philippe, however, manages to get away. When he returns to the village alone, Belle decides to ride Phillippe to find her father. The horse brings her to the castle, where Belle discovers that the talking Beast has imprisoned her father. Against her father’s wishes, Belle takes her father’s place. BEAUTY AND THE BEAST makes some small changes to the main story. For example, Belle’s father is no longer an inventor, he’s now an artist who makes beautiful music boxes. However, the basic story of a daughter who sacrifices herself for her father yet discovers true love by looking past appearances to see the inner beauty and worth within remains mostly intact. So, do the animated movie’s beautiful, delightful, moving original songs and melodies, such as the iconic title song, the “Be Our Guest” number, and the lyrical “Something There.” Happily, the filmmakers have added three new great songs, including a wonderful, heartbreaking ballad sung by the Beast called “Evermore,” which becomes one of the new movie’s highlights. The movie’s CGI effects aren’t quite as compelling as the original Disney animation. For example, at a couple moments in the “Be Our Guest” number, the reactions of Belle to the dancing and singing objects don’t have the same emotional depth. Her reactions needed to express more delight, or so it seems. Still, the number received a big applause at the end of the screening MOVIEGUIDE® attended. A more annoying problem with this live action version is the injection of anachronistic modern politics into this beautiful story. For example, the filmmakers have made Belle into even more of a feminist. The new Belle is teaching one of the younger girls in the village to read, and the school teacher maliciously chastises Belle. This is minor, however, compared to the movie’s inclusion of overt homosexual elements. For example, the villain Gaston’s bumbling sidekick, Le Fou, lusts for Gaston. When Gaston tells Le Fou he intends to marry Belle, Le Fou askes, “What about us?” Also, when Gaston admires himself in the mirror, Le Fou also admires the reflection, adding that he’s determined to “get” Gaston like Gaston is determined to get Belle. Then, during the musical number in the saloon where Le Fou sings Gaston’s praises, Le Fou clings to Gaston a couple times. Also, during the big battle between the villagers and the talking objects in the Beast’s castle, the magical wardrobe in Belle’s room dresses three of the unshaven men in women’s clothes, and one of the men clearly enjoys the cross-dressing. Later, during the movie’s celebratory ending, that same man, now in male clothes, starts dancing with Le Fou while all the other characters are paired off male and female. This last offensive image just magnifies the crazy, leftist identity politics and homosexual activism the filmmakers have admitted publicly they’ve wanted to promote. Introducing modern identity politics into a timeless fairy tale for children is the height of self-righteous smugness. It not only offends viewers who don’t agree with such controversial politics, or who don’t agree with inserting controversial politics into a movie for children; it also takes the viewer’s attention away from the main story behind the movie to stroke the egos of the filmmakers. Ironically, the kind of homosexual references included in this version of BEAUTY AND THE BEAST contradicts the story’s main message that sacrificial love, not lust or bizarre fetishes, is what lifts people up and ennobles them. This isn’t to say that the people in a homosexual relationship can never know what sacrificial love is. It’s only to show that the homosexual elements in this version of BEAUTY AND THE BEAST are a political stunt, a base attempt to indoctrinate children in a particular ideology and agenda that doesn’t match the rest of the story. 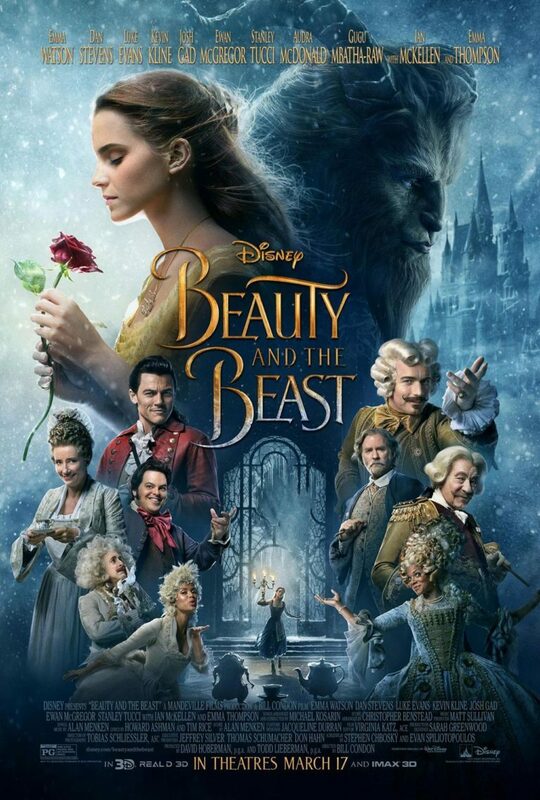 So, while many parts of this BEAUTY AND THE BEAST invoke the delights that can be found in the original 1991 animated version (not to mention the French classic by Jean Cocteau), the movie’s gratuitous politically correct elements make for an awkward experience that will annoy many people. Worldview: Light redemptive worldview with some elements of Christianity, including Belle receiving books from a priest in his chapel, which has a large crucifix hanging on the wall, and strong moral elements, interrupted by some Romantic, strong politically correct content featuring some light feminist elements but strong homosexual elements featuring male homosexual elements and a cross-dressing joke, with one male character dancing with another man, who was part of the cross-dressing joke during the movie’s climactic, often comical, battle, plus some magical elements of an enchantment. Language: No foul language but a slightly Christian reference to being “damned” forever, and a slightly Christian reference to being in danger of “damnation,” implicitly eternal and forever though not overtly stated. Violence includes scary snarling wolves threaten people in the woods, the “Beast” defends a young woman being threatened by the wolves and gets injured to the point of collapse, the Beast has imprisoned the girl’s father for stealing a rose, a villain shoots the Beast, magical objects in the Beast’s castle attack the villagers, who’ve come to kill the Beast, characters fall, a carriage breaks apart while being chased by wolves, some pratfalls during one or two musical numbers. Some homosexual and crossdressing references include villain’s bumbling male sidekick has homosexual lust for villain, sidekick asks, “What about us?” when villain informs him he intends to marry a young woman, when Gaston admires himself in the mirror sidekick also admires the reflection and adds that he’s determined to “get” the villain like the villain is determined to get the young woman, effeminate sidekick clings to villain a couple times during a musical number, three bad guys accidentally wind up in women’s clothes, but one of them leers at the viewers and shows that he secretly likes wearing women’s clothes (a promotion of transvestite behavior), and that same man eventually dances with the male sidekick in the movie’s final celebratory scene. Alcohol use; no smoking or drugs; and, jealousy turns into a desire for violence and murder, narcissism but rebuked, false imprisonment, uncontrolled anger, filmmakers insert gratuitous message. Disney’s new BEAUTY AND THE BEAST is an updated live action version of the 1991 animated classic based on the popular fairy tale. Belle is a strong-willed young woman in love with books. Belle wants adventure, and she finds it when she takes her father’s place after he’s imprisoned by a beast in a mysterious, isolated forest castle. The Beast is really a prince who’s been cursed for being selfish. The curse can only be lifted if Belle can learn to love the Beast of her own free will. However, a jealous suitor decides he must kill the Beast. The CGI special effects aren’t as captivating as the 1991 movie’s animation. That said, BEAUTY AND THE BEAST hits many of the same emotional highs in this tale of true love. Also, the songs are just as beautiful. However, this live action version has inserted some gratuitous, politically correct, homosexual references surrounding the villain’s sidekick. This content doesn’t fit in with the rest of the movie and seems forced. It’s also annoying and offensive. So, MOVIEGUIDE® advises caution for Disney’s 2017 live-action version of BEAUTY AND THE BEAST. Tim Tebow Knows The Power Of Finding Your Identity In Christ!